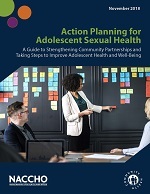 The purpose of this document is to provide LHDs and key community stakeholders with an overview of the process to envision, plan, and implement sustainable, community-driven initiatives that prevent HIV, STIs, and unintended pregnancies and support healthy sexual development through sexual health education, sexual health services, and safe and supportive environments. The action planning guide details several key steps—informed by NACCHO’s on-the-ground experience—to convene stakeholders, utilize participatory methods to determine strategic action areas, create an action plan to outline concrete steps toward the implementation of adolescent sexual health initiatives, and develop messages that support the successful engagement of key stakeholders and community leaders. This action planning guide was designed with school partners in mind but can be easily adapted to fit a different set of stakeholders.